Setting up emails that get sent automatically when each time a date is reached are one of the simplest ways to harness the awesome power of email automation. Date based automations are generally easy to set up but still give you the ability to send targeted, relevant, personalised and, above all else, timely – messages to your customers and prospects. Here are just a few examples of date based automations that can help to supercharge your conversion rates! Birthdays represent a fantastic opportunity for email marketers, and there are two main reasons why. One is that they give you the chance to reach out to your customers and simply show you care! Sending people an email to wish them a happy birthday is a great way to demonstrate that you value and appreciate their business. Further research conducted by Jeanne Jennings of ClickZ found that birthday emails can lift conversion rates by 60% over non-birthday email messages with the same offer. How can this be? There are several potential reasons. Recipients receiving emails on their birthday often have extra disposable income, and – whether to commemorate the occasion, or commiserate on becoming another year older! – often seem more willing to treat themselves if an offer catches their eye. The below example from the Fayre & Square pub chain is a great demonstration of an engaging birthday email. It’s nicely designed, has a clear ‘birthday’ focus and a compelling offer to bring the recipient into a pub to celebrate. Human beings are a forgetful lot and sometimes subscriptions and policies can lapse simply because we forget to renew them. Businesses have increasingly realised that this can be avoided by sending out renewal reminders – emails which tell a recipient clearly that their subscription is about to expire, and instruct them on what they should do next. This approach can be even more impactful if it’s made up of a series of emails instead of just one – for example, one sent a month before the subscription ends, then weekly emails until the subscription ends. One industry that does this really well is the price comparison sector. So, in the below example, a user has taken out a car insurance policy after comparing prices through ComparetheMarket.com. 11 months down the line, the guys at ComparetheMarket know that the user is likely to be shopping around for a new policy. The renewal’s Subject Line simply reminds the user that their policy is about to expire – they might not even have been aware. 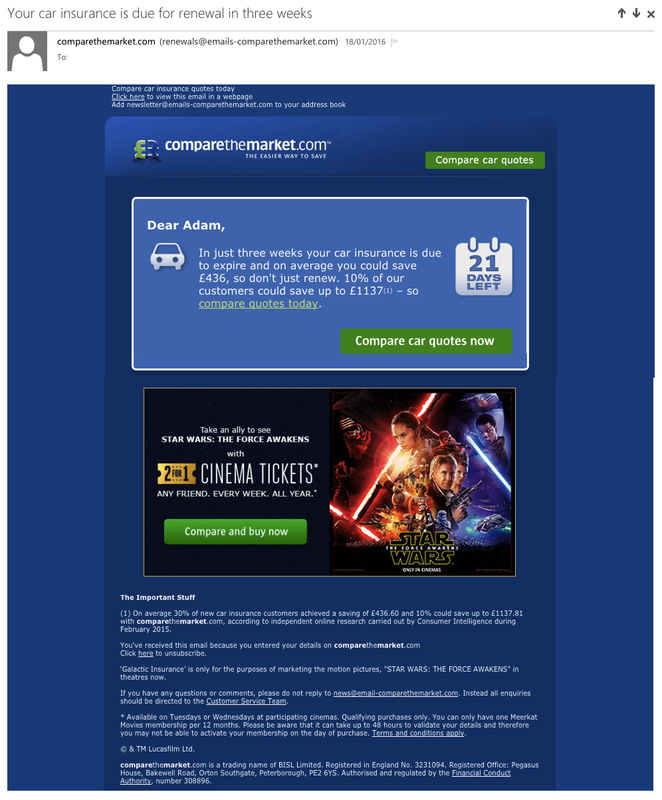 Once the email is opened, a simple ‘Compare Car Quotes Now’ call-to-action button within the body directs users back to the price comparison engine to quickly and conveniently compare prices on a new policy for the coming year. If your business works on a subscription model like this, Renewal Reminders are incredibly easy to set up, offer a valuable service to your consumers and – crucially – can help keep your retention rates high. We’ve already touched on Birthday emails, and here’s a similar model that can prove to be an excellent way to boost engagement. Anniversary emails simply commemorate the date on which a user opened their account or placed their first order with you. The best part about this is that it requires literally no additional data from the user. This means it’s a great way to send triggered, personalised content to people who might receive no other such content from you throughout the year. This helpful article from ReturnPath runs through some simple best practices for sending this sort of campaign – the general idea being to focus more on them than you! 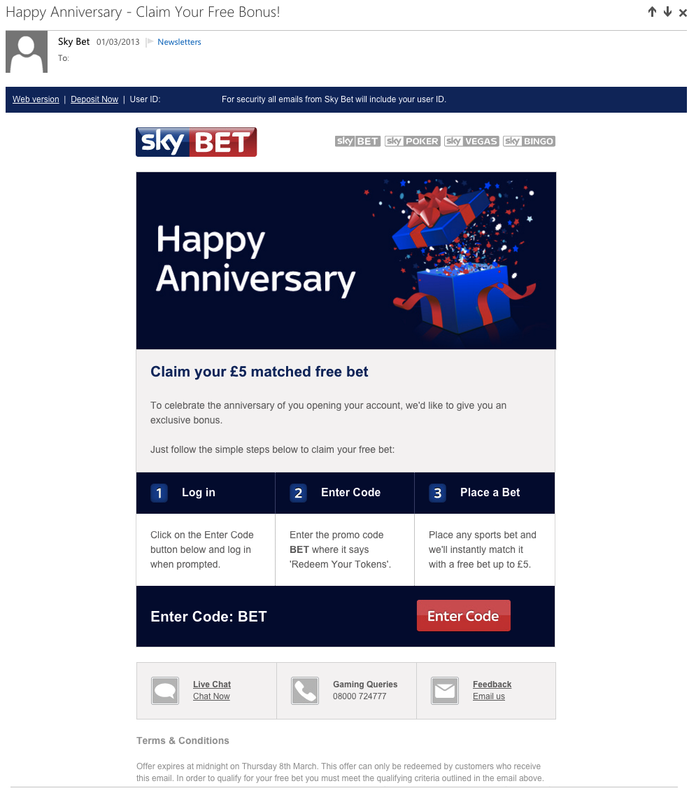 The SkyBet example below commemorates the anniversary of an account being set up by offering a small bonus, while the Pizza Hut example (picked from the ReturnPath article referenced earlier) offers a similar small freebie with the user’s next order. 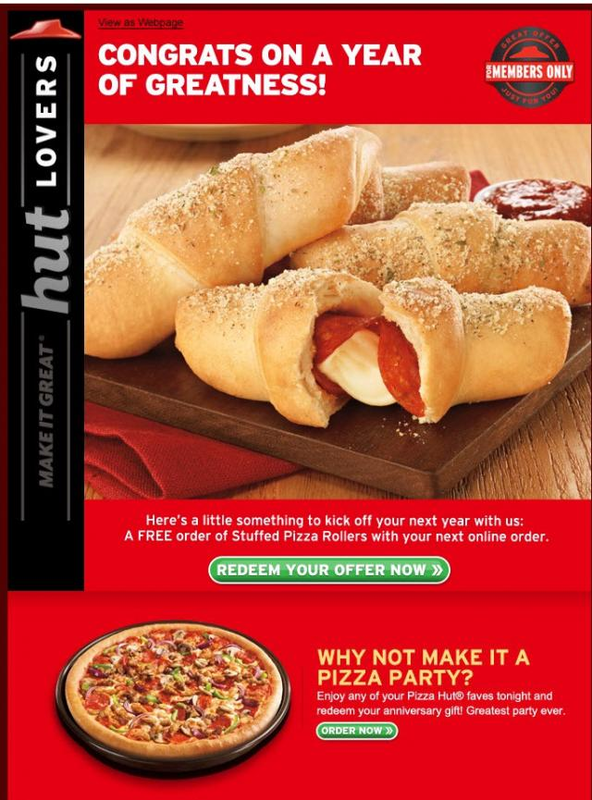 Interestingly, this email had a 16% higher read rate than the 30-day read rate average for Pizza Hut which just shows that this kind of email has a real ability to stand out in the inbox and invite opens. Ok, so this one is really a bit of a broad term which covers hundreds of opportunities. ‘Seasonal’ emails are fantastic! They can be sent out periodically throughout the year to mark all sorts of occasions with relevant promotions – Easter, Christmas, Mothers Day, Black Friday, Halloween. The list is almost endless! The best starting point here is simply to consult your calendar for holidays and plan well in advance so you can execute your campaigns properly. The best thing is, it doesn’t just have to be the ‘big ones.’ Clearly, sending out emails related to major holidays like Easter and Christmas is a good idea, but why not have a little fun and cash in on some ‘National Days’ that are relevant to your niche? National Day Calendar is a fun, easy-to-use website that lets you browse each month of the year to find ‘National Days.’ We’re in February right now and did you know, for example, that this month features a range of off-the-wall national days, from National Frozen Yogurt Day to National Polar Bear Day. We’ve picked two simple examples below. 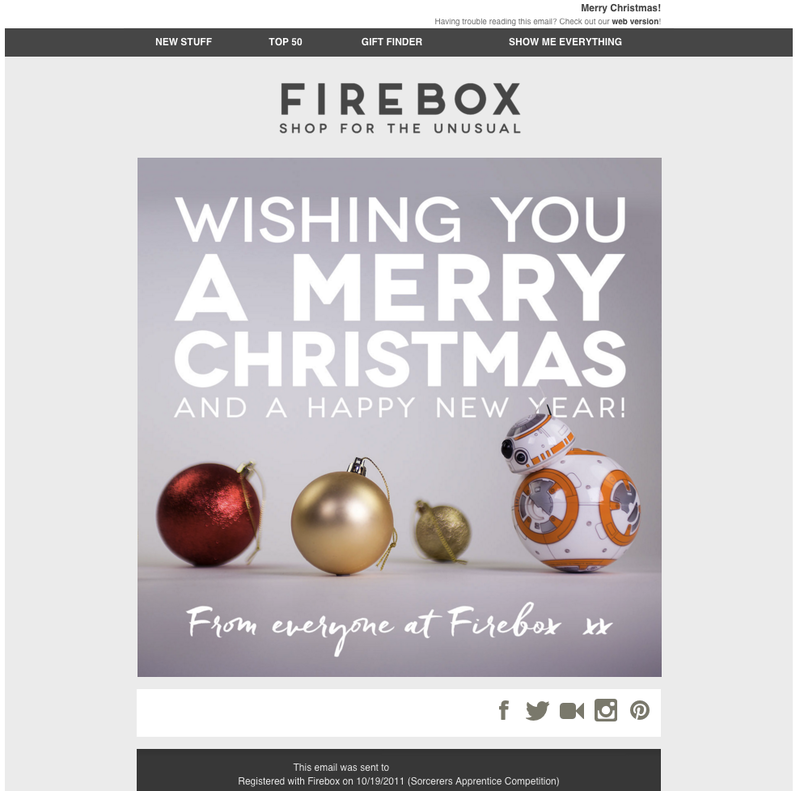 Firebox have gone for a simple ‘Merry Christmas’ email which isn’t particularly promotional but does send out a nice message. 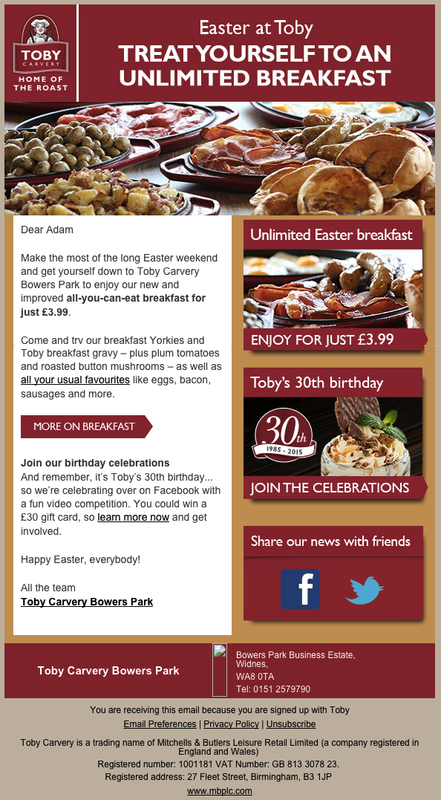 Toby Carvery, on the other hand – as you might expect from a hospitality company – have gone big on trying to bring customers in for their breakfast on Easter Weekend. This sort of campaign is often enough to sow the seed in the mind of your customers as they begin to plan how they’ll spend the holiday, and it’s a great way to boost conversions. 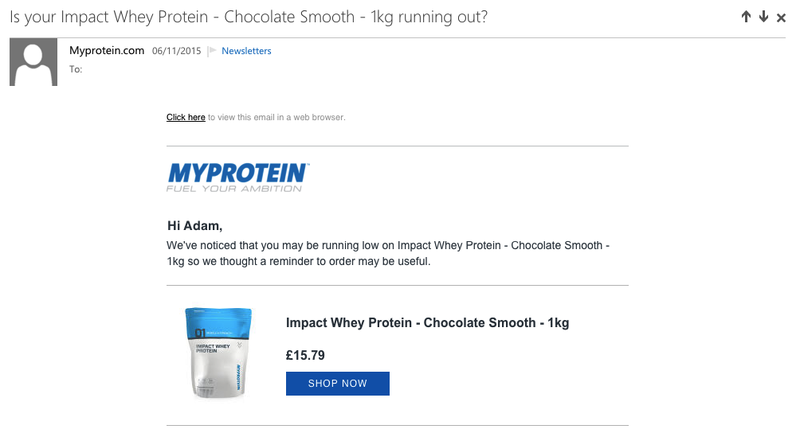 This is a tactic that seems to be on the rise, and it’s well demonstrated by the example below, from MyProtein.com. Quite simply, it involves working out roughly how long each of your products will take to use up. You can use real data to work out how long, on average, it takes before customers reorder your products. This allows you to send out reminders, much like the subscription renewal reminders mentioned earlier, which ask whether the customer is ready to place another order. This is particularly useful when you’re offering a product that customers need throughout the year, as in the example above. Date based automations offer you tens, if not hundreds, of opportunities every year to reach out to your customers & prospects with targeted, relevant, highly personalised and timely messages. Best of all, while these techniques are very sophisticated, they’re actually fairly easy to set up. Using Instiller, you can design Workflows easily, step-by-step, using a simple drag and drop interface that means you don’t even need to write any lines of code if you don’t want to. p.s. Keep an eye out for our complete guide to setting up automated Workflows within Instiller, coming soon!